On February 4, Maryanne Grisz, an instructor of fashion marketing at Parsons, will see the official release of a documentary film project that has been close to her heart. Dressed tells the story of Nary Manivong, a fashion designer who overcame the challenges of a tough childhood and homelessness to launch his own label. The film documents highs and lows of Nary’s journey to become a successful fashion designer, interspersed with interviews with important voices from within the industry, including Fern Mallis, founder of New York Fashion Week; designer Nanette Lepore; style commentator Simon Doonan; and Simon Collins, dean of the School of Fashion at Parsons. “The goal of this film was to celebrate his work but also give realistic view of industry,” said Grisz, who is a partner in the production company Onerock Moving Pictures and also has worked for many years in the fashion industry as an event producer. Grisz, along with directing the marketing and distribution of the film, is now setting up a non-profit organization, working with the Bronx public school system, which will bring fashion experts into the schools for special screenings and discussions with students who aspire to enter the industry. 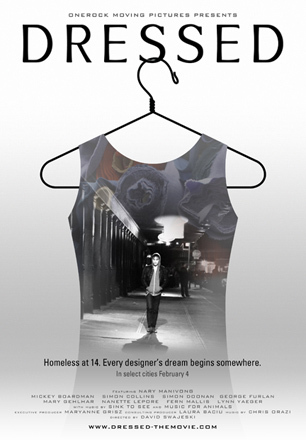 The non-profit will also help students start their own fashion clubs. The film will open February 4 in New York at Clearview Chelsea Cinemas, and also in Nary’s hometown of Columbus, Ohio, and other select cities nationwide. The DRESSED soundtrack and a web series will be released In February. For more information, visit www.dressed-themovie.com.